GG Abseil Services are able to provide highly skilled tradesmen, all IRATA trained rope access technicians, to access many building types no matter the height and size of the building. We are able to conduct the inspection, installation and repair of cladding systems across the nation. Our access methods are rapid and cause minimal disruptions to our clients. GG Abseil has the experience of inspecting, repairing and replacing all key cladding materials, whether it is box profile, fibre cement or timber cladding. Alongside our install and repair cladding service, GG Abseil Services are able to provide scheduled maintenance programmes to aide in the prevention of leaks and draughts from deteriorated sealing works to choked water drainage systems. Like all our other services, we’ll conduct all works with minimum disruptions caused to our client by working around their schedule and when required out of hours work. We’ll use our industry expertise and fully qualified technicians to complete cladding inspections, installs and repairs across the United Kingdom. 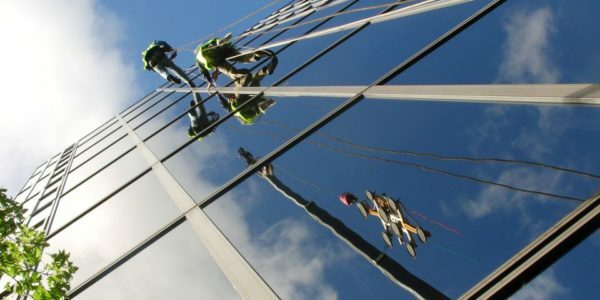 No matter what your cladding type, age, current condition or material, GG Abseil Services can inspect, clean, repair and replace cladding panels to a buildings exterior.